From the Jordanian League to his prominent role with a Turkish Airlines EuroLeague powerhouse, it's fair to suggest that Fenerbahce Beko Istanbul big man Ahmet Duverioglu has taken a unique route to the top. Born in Istanbul to a Turkish mother and Jordanian father, the 26-year-old Duverioglu took his first steps in professional basketball in his father's native land, representing a series of clubs and winning a pair of Jordanian titles with Applied Science University in 2013 and 2014. But he had always held aspirations of joining a big European club, and that ambition became a reality in 2015 with a return to Istanbul as he joined Anadolu Efes. And although Duverioglu had always hoped for such a big opportunity, he admits it was a huge challenge when the moment finally arrived. "It was my dream to play in Europe, but when it happened, it came so fast – first with Efes and then with Fenerbahce, the two biggest clubs in Turkey," he recalls. "Coming from the level of Asian basketball, it was a big dream for me, but also a big step and I had to adjust fast. It wasn't easy on a personal level because I didn't have any friends or connections, but I came to work. In Jordan there were no facilities to work properly, but in Istanbul I have everything – there is no excuse not to work." "Coach Ivkovic in Efes...taught me how European basketball works." After making that return to Istanbul, Duverioglu's strong work ethic quickly earned him favor with legendary Efes coach Dusan Ivkovic, who quickly became one of several pivotal figures in his rapid development as a player. "I was so lucky to sign with Coach Ivkovic in Efes," he recalls. "He gave me so many things and taught me how European basketball works, because everything was different from where I had been playing in Jordan. That first year in Europe was tough for me. It wasn't easy, but he gave me his trust and from that point I started to understand more about European basketball." When asked to specify exactly what he found so difficult when he moved from Jordan to Turkey, Duverioglu considers for a moment and then provides a straightforward answer: everything. "Firstly, tactically," he asserts. "In Europe, every move you make on the court depends on your team and your system – the system is a lot more important here. You have to think all the time. It's a very big difference between Asia and Europe. The game is much faster here, so you can't stop concentrating even for one second. You can't sleep or the opponent will punish you. You have to be awake all the time. "Also mentally it's more difficult. You have to be mentally strong, when you have lots of fans putting you under pressure and putting big expectations your way. Especially at Fenerbahce, every game we play, our opponent has a big motivation to beat us. So we have to be even more motivated ourselves. We have to do our job and if we do that everything will come. How you work is how you play." Over the course of 10 EuroLeague appearances with Efes during the 2015-16 season, Duverioglu did enough to attract the attention of Fenerbahce, where his development continued as he swapped one iconic coach for another, leaving behind the influence of Ivkovic to now work with Zeljko Obradovic. 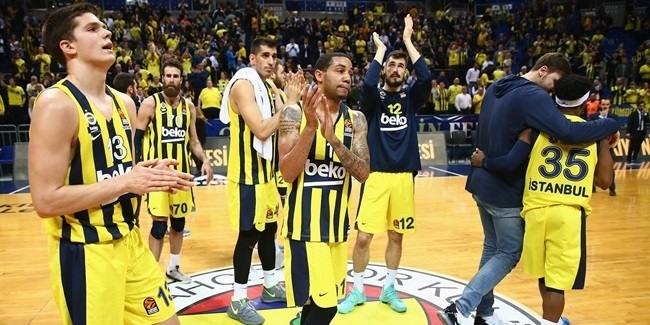 Under his new boss, Duverioglu quickly discovered that the phrase which best describes Obradovic is "tough love" – with the emphasis on both words. "Off the court, Coach Obradovic is not anything like he is on the court." "I remember when I played my first game in the EuroLeague for Fenerbahce," he recalls. "We were switching on defense but I stayed down, and the guy made a three-point shot over me. The coach yelled at me so bad! And I made sure that I listened to everything he has told me since then. That's how he makes his point – you know that you don't make the same mistake again. Of course, everyone makes mistakes, but if you want to improve you don't make the same mistake twice. It's not easy because the game is going up and down, you get tired, so your mental game can also go up and down, and he wants to you make less mistakes even when you're tired. Now it's easier because I know what he expects, I know the system and what he wants from the team. "Off the court, Coach Obradovic is not anything like he is on the court. He's a very funny guy, he talks to you and is very relaxed, nothing like he is in the court. He also told me once that the only time to be scared of him is when he's not yelling at you, because that means he doesn't care about you. If he's yelling at me, it's because he cares!" 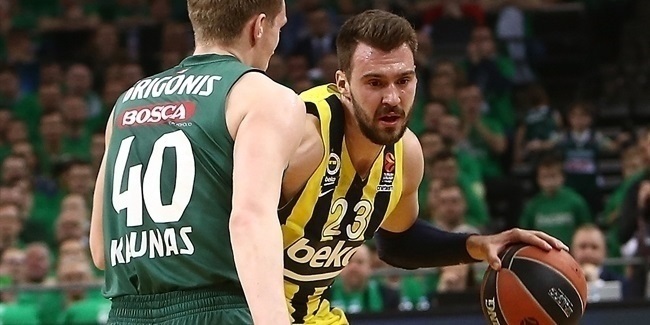 In addition to benefitting from the guidance of two legendary coaches, Duverioglu has also been able to learn from some great players – and never more so than the 2016-17 season, his first with Fenerbahce, which saw the Turkish team power to the EuroLeague title with a major input from two outstanding big men, Jan Vesely and Ekpe Udoh. Duverioglu happily admits that being given a close-up look at those two terrific talents in his own position on a day-by-day basis quickly accelerated his progress, saying: "It was a very big advance for me to play with those two great players, they taught me so much and helped me a lot. I'm still in touch with Ekpe now and I spent some time with him last summer. "One of the things he taught me is that sometimes I was using my hands too much on defense. He and Jan also showed me things like the importance of timing, how to set a screen, how to play in the low post, and how to make the right spacing between the two bigs, which was something they did great. "I'm very happy to have played with some great players who have given me motivation inside and outside the court. They helped me a lot to prove myself and play better." After Udoh's departure, Duverioglu took on a bigger role in the team, jumping from nine EuroLeague appearances in the 2016-17 season to 27 during the following campaign. 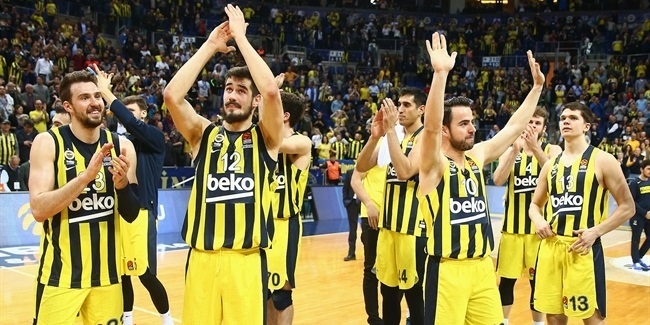 And they were serious minutes, too – especially when Duverioglu received the ultimate compliment from Obradovic of being named in the starting five for both games at last season's Final Four. He made the most of that opportunity by scoring 8 points in the opening 6 minutes of the championship game against Real Madrid, and admits that memory is fresh in his mind as this season's playoffs roll around. "That motivates me a lot," he admits. "Being named in the starting five at the Final Four was a big advance for me and showed that the coach trusts me. Now, I have to work hard to make him trust me even more." The confidence that Fenerbahce has in Duverioglu was again made plain early this week, with the Turkish team signing him to a new three-year contract. And as his profile within the team rises, this hard-working big man is determined to repay that faith – which he also regards as a personal challenge. "I have to work more and concentrate more because I know they expect more from me," he concludes. "That's why I have to always give more for the team. I have to keep working hard. This is just the beginning, and every year I want to improve and become a more important player for the team." Duverioglu has already come a very long way – but his journey is by no means over.